Considering who he is, Sting doesn't take up much space on stage. He strums his bass guitar with elbows pulled tightly in, shoulders hiked up slightly toward his ears, knees pressing in together. He doesn't pace back and forth - in fact, he moves only to allow other members of his band to take center stage during their solos. His Back to Bass tour - which stopped in Detroit on Sunday evening at the Fox Theater and promotes his most recent album, Sting: 25 Years - is as unpretentious as his stage presence. It doesn't involve any theatrics, complex lighting or elaborate effects. He is accompanied by a simple five-piece band: a violinist, a backup vocalist (who also doubles as a second violinist and maraca shaker), two guitarists and a drummer. Sting's performance felt decidedly stripped down and intimate; in between songs, he recounted stories from his childhood, explained his creative process and talked about his love for his wife, speaking to the crowd with heartfelt honesty and candor. Before he began 'Ghost Story', written about his late father, Sting paused and quietly admitted his regret for never reconciling their relationship before his father's death. While he described his strained upbringing - a father who didn't understand, a son who did his best but was inadequate - stillness settled over the audience. The people in front of us wiped away tears and the concert began to make sense: it was a celebration of 25 years, and the mostly middle-aged concert-goers have spent half of their lives listening to and adoring Sting's lyricism. When Sting once again picked up his bass, the lines, "I did not miss you much/I did not suffer… I must have loved you" felt as if he were reassuring himself of his own relationship. He didn't spend the entire two hours, however, in a state of melancholy. Sting has a potty mouth and a surprising sense of humor; he even threw in a few pelvic thrusts behind his guitar when the tempo picked up. Prefacing the song 'Stolen Car', he took a lighthearted jab at Detroit. "Cars are harder to steal these days," he said. "But you'd know all about that." Two breaths later, perhaps recognizing a sore spot for the audience, he pointed out that all the cars that get stolen are made in Detroit anyway. The live performance also afforded Sting and his band-mates the opportunity to showcase their talent. Peter Tickell wailed away in upper stratosphere of his fiddle and the audience jumped to their feet; Dominic Miller played fiery riffs and his son Rufus strummed the famous notes to 'Fields of Gold'; vocalist Jo Lawry demonstrated a range that was practically operatic. Sting's music, sometimes described as "world" music, is rooted heavily in a classic singer-songwriter tradition, though it is punctuated by Eastern, Latin and western influences. Beloved songs like 'Every Breath You Take' and 'Desert Rose' left diehard fans in a state of rapture. Sting and Detroit have a history together. Though Sunday was Sting's first time at the Fox (he commented especially on its beauty, by the way) he has been coming to Detroit since 1978, when he played his first show here at the old Bookies with the Police. Given Sunday's retrospective, it is probably fair to say he has come full circle. 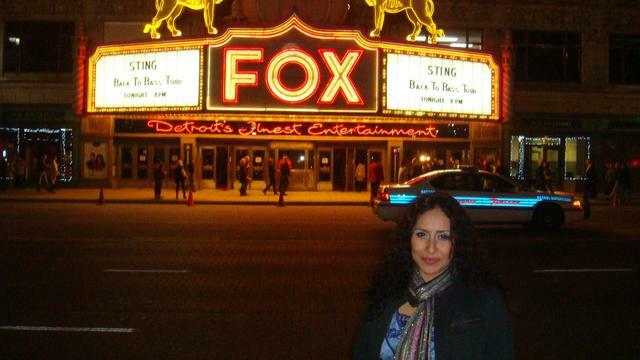 The place to be on Sunday night was downtown Detroit at the amazing Fox Theater/Temple. The old radio towers above the theater were illuminated and radiated a beacon call for all those around. An alchemist was to practice his craft among the grandeur of the temple of goddesses, gods, wizards and various and sundry deities. Immediately the crowd was whipped up in a fever of collective happiness and joy; meanwhile the wizards on stage brought in, absorbed and reflected back the energy tenfold. Somehow they concentrated the sheer power of collective ecstasy and delivered a performance simply beyond believe. What an incredible gift! Everything about the evening was Magick (the amazing Fox Theater, the performance, the vibe). What a special gift! My Lady Lily said that it was true was Sting said about Love, "it fills in the gaps" and makes us complete. Thanks for a wonderful evening! Ticket master not working it is 11:15am EST, FYI, this blows... Better things to do with my time! Where are tickets at 10?? Trying to buy tickets...I'm a legacy member and it's not available. This is really really annoying me since I moved a meeting to get these tickets.